Watch the butterflies fly out of the elephants trunk and catch them with nets. The butterflies fly out fairly quickly though, so the game is over in about fifteen seconds. The elephant trunk is three feet tall and the set comes with 18 butterflies in varying colors, and seven white butterflies that glow in the dark. Four C batteries are needed for the trunk to blow out the air, and some users have said the batteries die pretty quickly. Some reviewers also mentioned that the air blows all the butterflies out at the same time and in clumps, so the game is over in fifteen to twenty seconds. 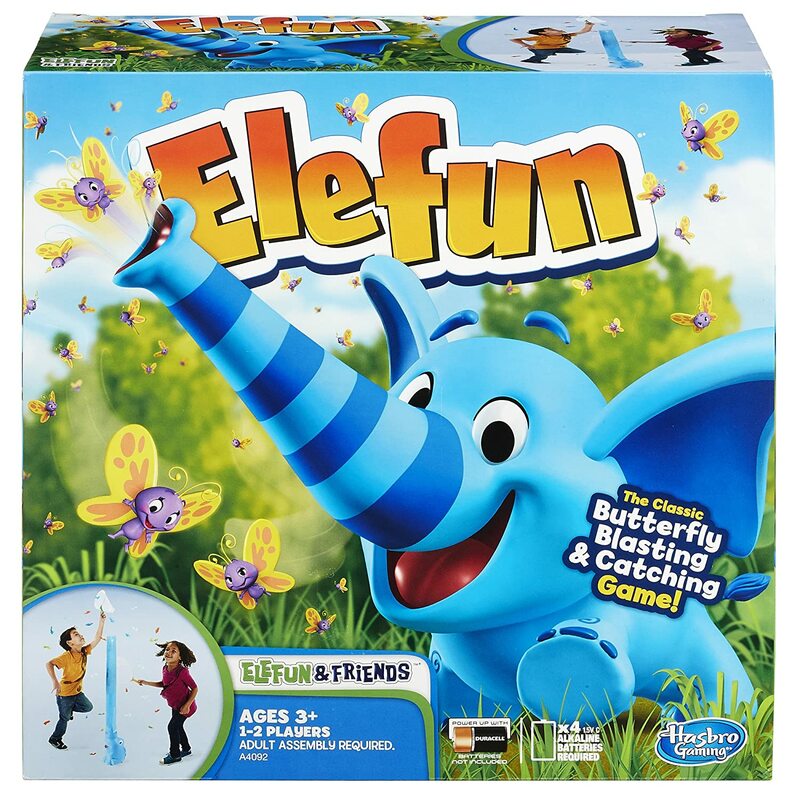 Kids can catch butterflies and glow in the dark fireflies that fly out of the elephant’s trunk in the newest version of Hasbro’s Elefun! Comes with nets to catch butterflies. Game needs four ‘C’ batteries. To play, four C batteries need to be put in the trunk so that it will blow the air to release the butterflies and fireflies. Put the butterflies inside the trunk, and turn the air on. They will begin to fly out of the top, and kids can catch them with their nets. The newest version of Elefun comes with not only butterflies, but glow in the dark fireflies too! The game can now be played in darker settings, but is not recommended to be played in total darkness. However, users have several complaints about Hasbro’s new model. When the butterflies come flying out of the trunk, they are only in the air for five seconds and they don’t go very far. Users said it’s usually only fifteen seconds and all the butterflies have flown out and the game is over. Also, the elephant trunk in this version is a whole foot shorter than in the old game. It used to be four feet, and not it’s only three feet tall. Because of this, the butterflies don’t get to fly as high. Even if you put the four batteries in, it has been said that they tend to run out very fast. Users also commented that the nets provided with the game break easily when kids are trying to catch the butterflies. The game comes with the elephant trunk, two firefly nets, 6 orange butterflies, 6 green butterflies, 6 blue butterflies, and 7 white butterflies that glow in the dark- the fireflies. It also requires four “C” batteries that are not included with the game. Many users had the same concern- that the butterflies all flew out at the same time and the game was too short, sometimes lasting less than a minute. The butterflies have been said to come out in clumps and they’re all gone after fifteen seconds. 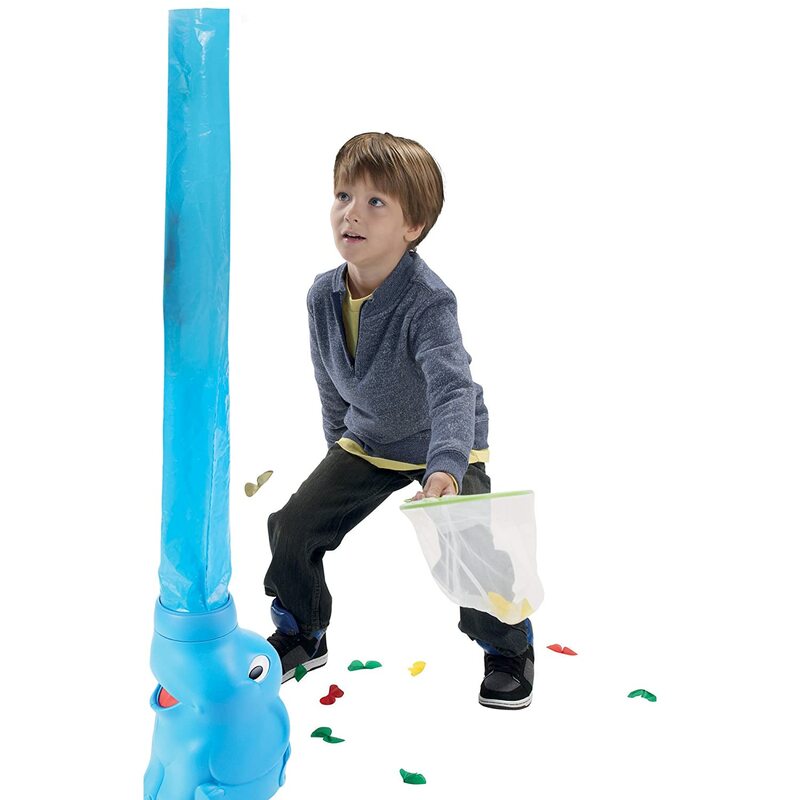 Join Elefun in his silly firefly-chasing game! Use your net to chase fireflies around the room; catch as many as you can to win! For an extra way to play, dim the lights, and watch as Elefun's mouth and some of the fireflies glow! Elefun and Friends games are all about unpredictable, lol fun! Every moment is an adventure with these silly friends! Get ready to race, shake, stomp, and laugh!